Built like a tank and able to hold 600 lbs. of weight plates in only three square feet of floor space, the Legend 3112 plate holder helps keep all sizes of Olympic plates and Standard Plates up off the floor and neatly organized. As is typical with Legend Fitness products, the 3112 is Made In The USA using 3 x 3" x 11 gauge big steel tubing to insure long lasting structural integrity and safety. The 3112 features solid 1" diameter steel weight plate pegs that are compatible with all brands of Olympic plates and most Standard plates. There's no assembly required on this heavy-duty plate tree as the frame and weight pegs are all MIG welded together at a minimum of 70,000 PSI tensile strength. 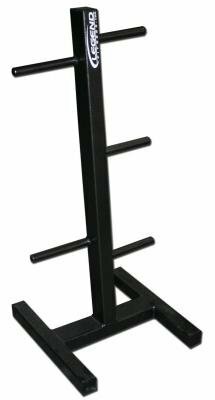 If you're looking for a commercial strength plate storage solution for your home, studio or club, the Legend 3112 Weight Plate Tree is a solid investment as it will hold up in any environment and never have to be replaced. Since 1977, Legend Fitness has been committed to providing quality manufactured fitness equipment that is heavy-duty and proudly Made In The USA. Legend Fitness Equipment is made with big steel and perfect for schools, commercial gyms, military bases or anywhere that quality and safety cannot be compromised. Weight plates are NOT Included (shown in image for demonstration purposes only). Weight plates NOT included. Designed to hold Standard Plates (1" hole) or Olympic plates (2" hole). 3" x 3" 11-gauge frame. Five 8-inch solid steel pegs are 1-inch in diameter. Holds up to 600 pounds. Pegs are spaced apart to accommodate smaller and larger weight plate diameters and increments. Fully welded construction. Chip resistant finish. Silver Vein color. MADE IN THE USA. Unit dimensions: 18" L x 18" W x 42" H. Shipping Weight 42 lbs. View More In Plate Storage Racks.